Our selection of boat lifts includes something for virtually any boat owner, regardless of their needs, vessel, or budget. For example, our entry-level boat hoist, though highly affordable, offers reliable lift operation and has lift capacities of up to 16,000 lbs. Our DECO lift is the most popular, as it can accommodate a wide range of vessels, offers whisper-quiet operation, and has a proprietary sealed gearbox design for enhanced reliability. And, for boat owners who want the industry’s most advanced boat hoist available, we offer the Concept CRS Lift. With a direct drive system, this lift system provides unrivaled power with little maintenance required. And, it comes standard with our patented Cable Retention System (CRS), which reduces cable wear by ensuring they remain in the winders at all times. Our variety of lift configurations ensures you can find an option that suits your docking scenario. 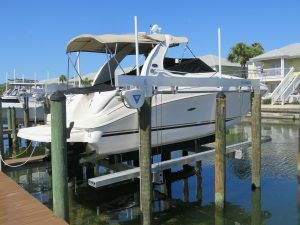 For example, if your property is in a narrow canal or another area where pilings can’t be used, one of our boat elevators, which can be mounted directly to the seawall, is the perfect solution. We also offer a Beamless Lift, which is free of overhead beams and doesn’t require underwater cabling, helping to reduce wear. For more information about the benefits of having a boat hoist installed on your property in Beaufort, NC, contact DECO Boat Lifts today.